So, we always celebrate Epiphany on January 6th? We did in 2013 because the 6th fell on a Sunday. But since 1970 in the USA we celebrate the Epiphany on the first Sunday after January 1st. In 2015, it is January 4th! OK, so here in the United States we will always celebrate it on a Sunday. But at least the meaning of the celebration is the same? In all cases the Christian feast day celebrates the revelation of God the Son as a human being in Jesus Christ. Western Christians commemorate principally (but not solely) the visitation of the Magi to the Baby Jesus, and thus Jesus’ physical manifestation to the Gentiles. Eastern Christians commemorate the baptism of Jesus in the Jordan River. I thought we had a separate Sunday for the Baptism of the Lord? In the “Latin Rite” we do. A separate celebration of the Baptism of the Lord was introduced for Latin Rite Roman Catholics in 1955. Initially, it was celebrated seven days after the Epiphany, but in 1970 the date was changed to the first Sunday after January 6th. We will celebrate it next Sunday. 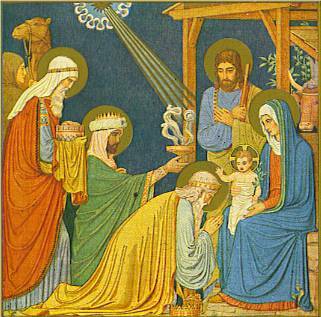 In a year when the Epiphany (Sunday) falls on January 7th or 8th, the feast of the Baptism of the Lord is celebrated the next day, Monday. As it happens, Magi are not kings – they were astrologers and possibly Zoroastrian priests. The identification of the Magi as kings is linked to Old Testament prophesies that have the Messiah being worshiped by kings in Isaiah 60:3, Psalm 72:10, and Psalm 68:29. Early readers reinterpreted Matthew in light of these prophecies and elevated the Magi to kings. By AD 500 all commentators adopted the prevalent tradition that the three were kings. And the text never says there are three – we just infer that from the number of gifts. But in any case, we are celebrating the visit of the first Gentile worshipers of the Savior. No worries – we will still sing “We Three Kings” in celebration. Balthazar (also Balthasar, Balthassar, and Bithisarea), an Arabian scholar. But those names are only used in the West. In contrast, the Syrian Christians name the Magi Larvandad, Gushnasaph, and Hormisdas. After they visited Jesus, the Gospel says that they returned home by another way so as to avoid King Herod. Do we know what happened to them? In short no, but there are many traditional stories about what happened to the Magi. In one account, one of the Magi is baptized by St. Thomas on his way to India. Another has all their remains found by St. Helena and brought to Constantinople, and eventually making their way to Germany and the Shrine of the Three Kings at Cologne Cathedral. The three gifts had a spiritual meaning: gold as a symbol of kingship on earth, frankincense (an incense) as a symbol of deity, and myrrh (an embalming oil) as a symbol of death. This entry was posted in Catholic, Scripture and tagged Epiphany, Three Kings by Friar Musings. Bookmark the permalink.